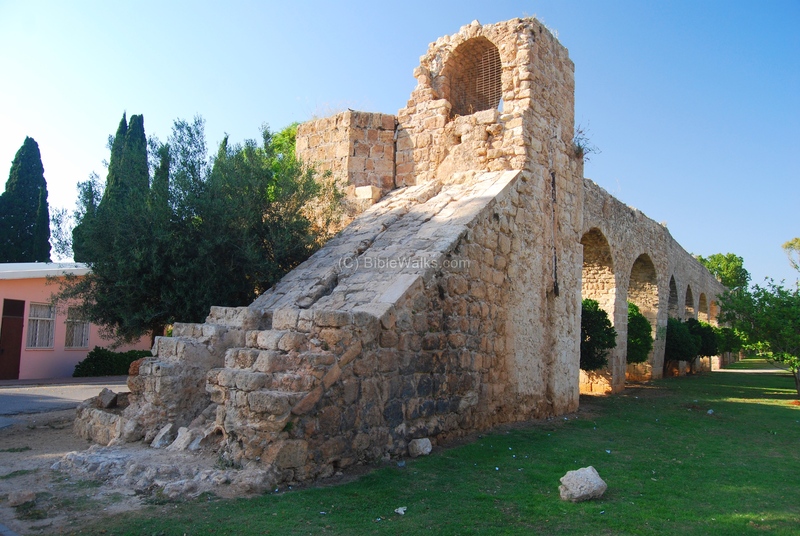 The Aqueduct brought running water to the old city of Acre along a series of raised canals, towers and stone pipes. The source of the water was the springs of Cabri, 14KM away. Proverbs 5 15-16: "Drink waters out of thine own cistern, and running waters out of thine own well. Let thy fountains be dispersed abroad, and rivers of waters in the streets." 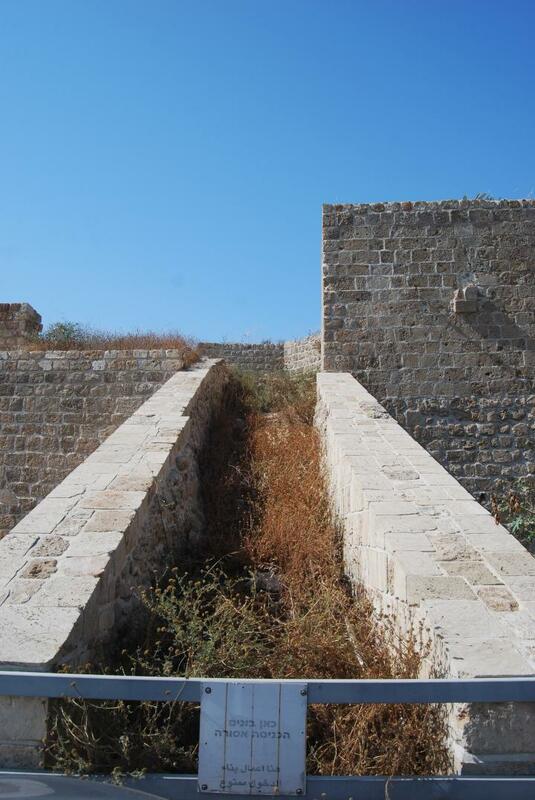 The old city of Acre (Akko) required a steady flow of running water. In the earlier stage of the city, the adjacent Naaman (Belus) river supplied this flow, and was the symbol of the city as minted on the Greek coins. However, when the population grew and the city moved to its present location, a new construction of an aqueduct was required. This water line was built on an aqueduct, bringing in the water from the northern springs of Cabri, about 14KM away from the city. The springs are 70M high while the city is at sea level, so the slope of the aqueduct is a 5M drop along each kilometer (rate of 0.5%). There were several aqueducts constructed over the 2,000 years, running in different routes from Cabri springs to the thirsty city. The oldest line was constructed during the Hellenistic period, while the modern one - which is visible today in various stations along the route - was built 200 years ago and supplied the water until 1948. On the outskirts of Acre the Ottoman open canal aqueduct was converted to a closed system, based on siphon towers and modular stone units. After passing the walls, the aqueduct supplied the water in several lines in the city, and one of them reached to vast underground cisterns the El-Jazar Mosque in the center of the old city. 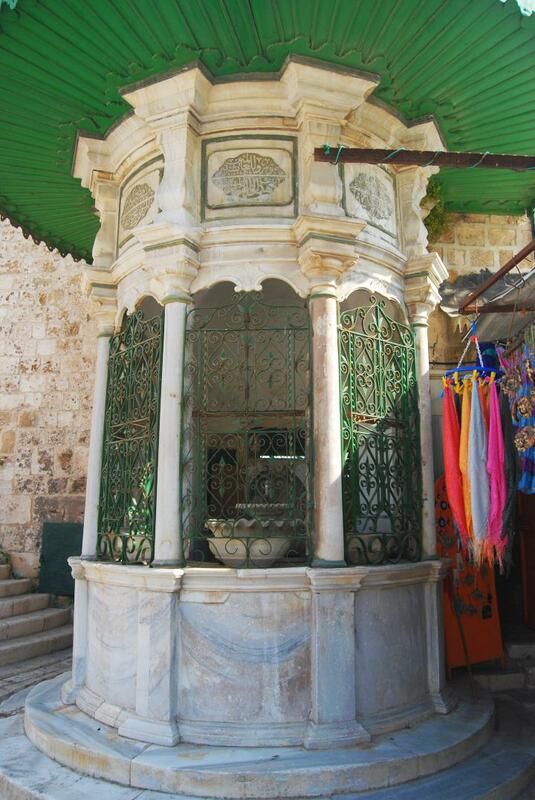 Several dozens of sebils (water fountains) distributed the waters throughout the Ottoman city. 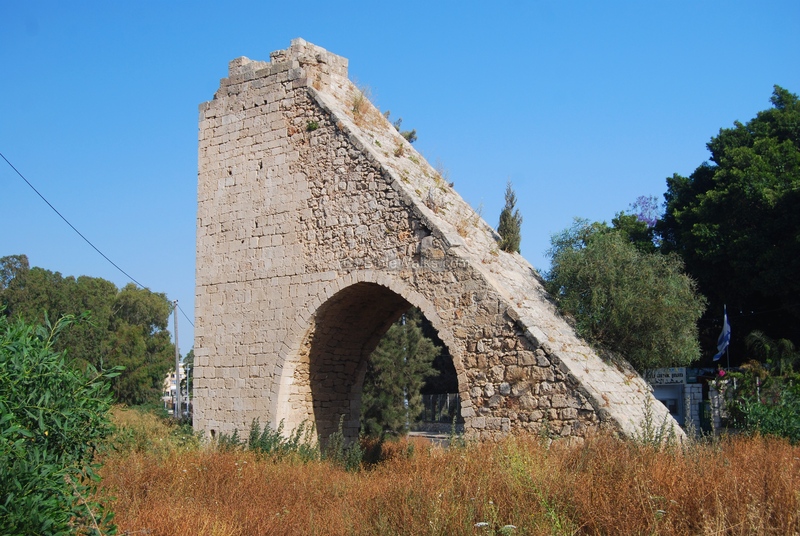 An early aqueduct was built in the Hellenistic period. 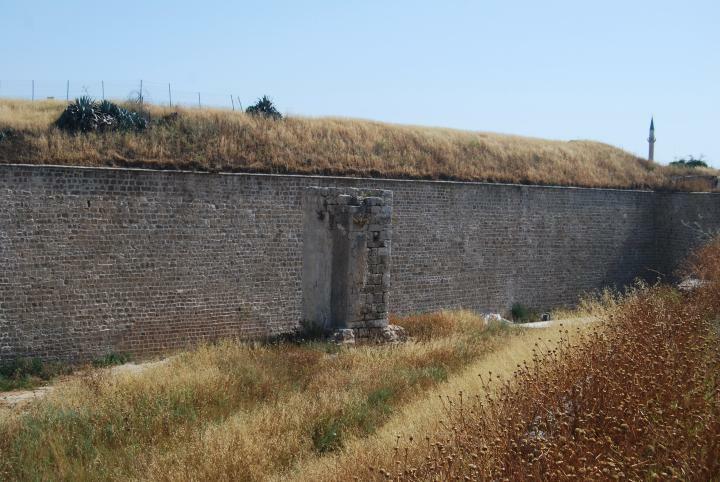 From this aqueduct, which was mostly underground, several sections were discovered, including a Kilometer long section near Ness Harim, and two more sections in Kibbutz Lochamei Hagetaot. 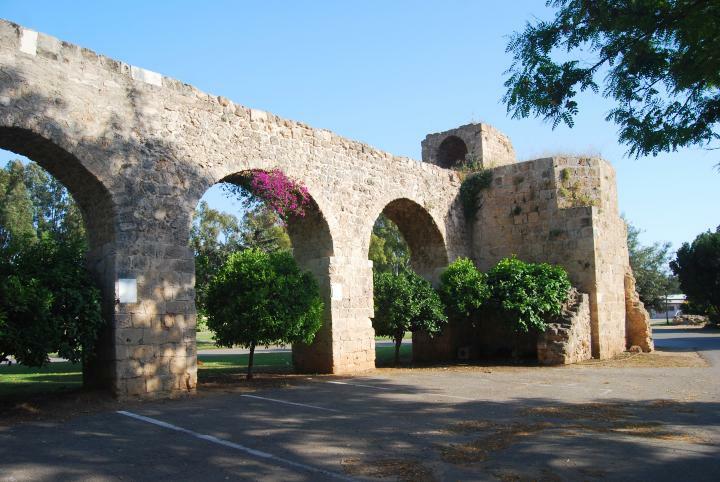 A new aqueduct was built in the end of the 18th C AD by Jezzer Pasha, the Ottoman builder of Acre. It was rebuilt by his son, Suleiman, in 1814-1815 AD. The aqueduct was in operation until 1948AD. 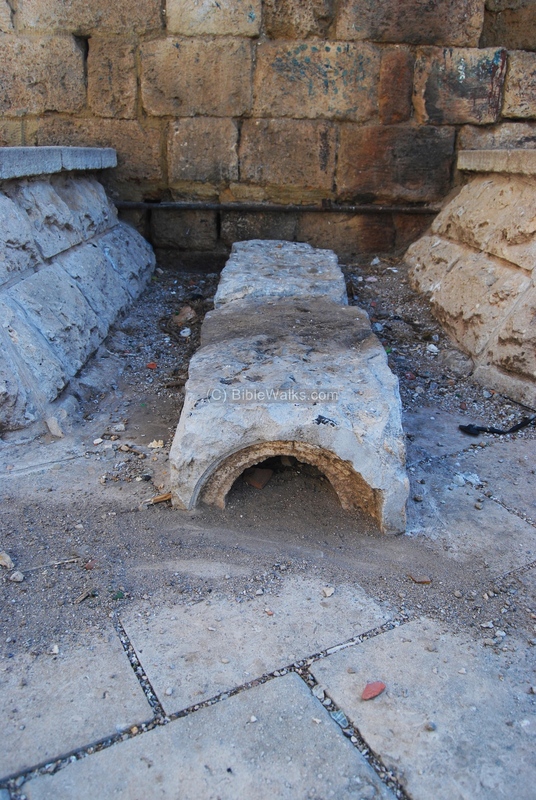 The remainder of this page focuses on this Ottoman aqueduct. The majority of the aqueduct was based on a raised open canal, which was constructed above arches or above a raised sandstone mound. The water flowed down from the higher springs towards the city. The channel, about 0.5M wide and 0.8 deep, was coated with plaster. 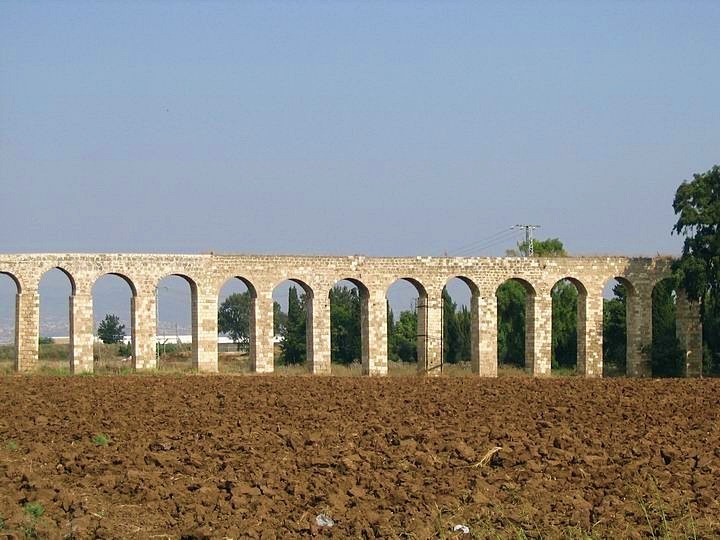 In order to regulate the water flow, a series of siphon towers were built along the path of the aqueduct. The water from the aqueduct was raised up with the pressure of the incoming water, and stored in a pool. The waters then continued with the power of gravity to the next tower and finally to the water outlets in the city. The internal tower pipes were based on round ceramic pipes. 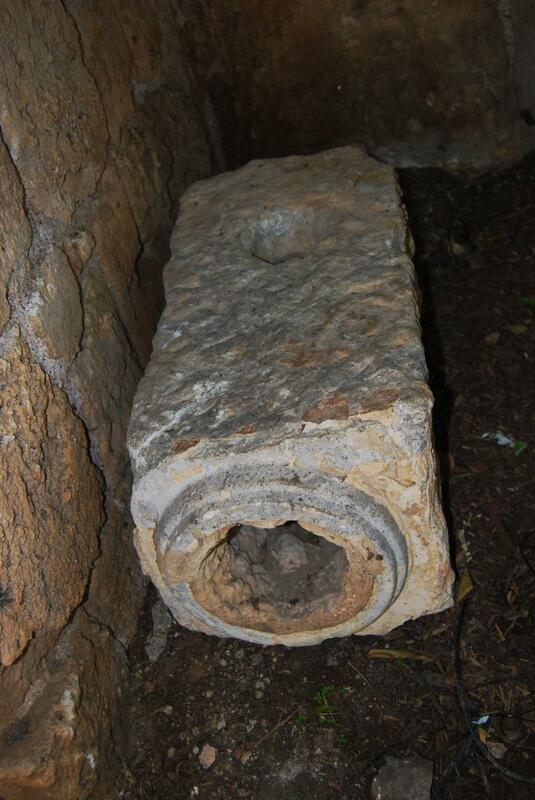 The underground pipes were based on modular stone units that held the pressure of the water and were easy to replace. The plan of the Ottoman aqueduct is seen in the following illustration. It shows the major elements from the springs in the north (left side) to the city (on the right side). The distance between each tower outside the city is roughly 500M. Each of the water system elements is detailed in the sections below. You can point on the letter below each element to navigate to the selected section in this web page. The aqueduct can be seen in several sections between Cabri and Acre. 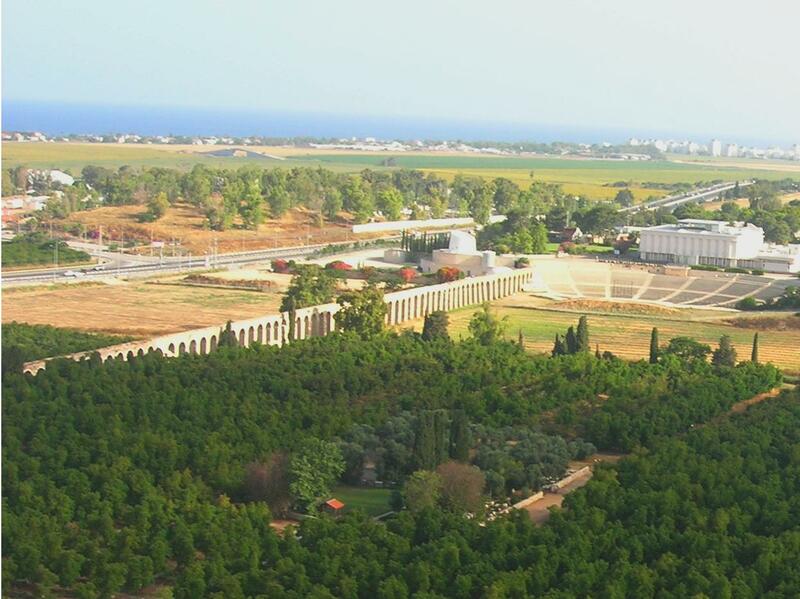 The famous section is near Kibbutz Lochamei- Hagetaot, in the center of the aqueduct. A rough plan of the Ottoman aqueduct is shown in the following photo, with indication of the featured sites. Pressing on the purple dots will to navigate to the selected section in this web page. 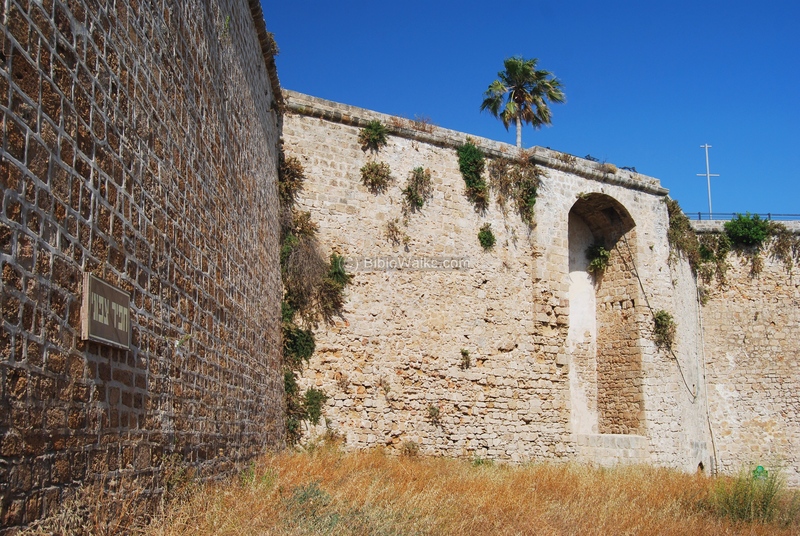 The photos of the Ottoman aqueduct are arranged from North-East (the source of water) to the South-West (the final destination in the walled city of Acre). 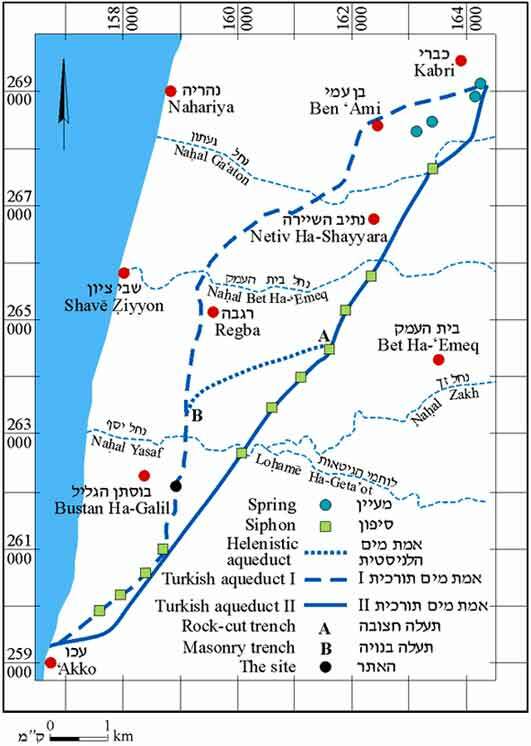 The main source of the aqueducts came from the springs in the vicinity of the ruins of the Arab village of El-Cabri, south of the modern Kibbutz of Cabri. This village was built over older layers (Roman, Byzantine, Mameluke). Closer to the source of the springs, near Kibbutz Cabri, is a section from the aqueduct of Suleiman Pasha, built in 1814AD. The following photo shows a section which is 100M north to the monument of the convoy (1948), near the El-Cabri Arabic cemetery. This section, an open canal, is 500M away from the Cabri springs. 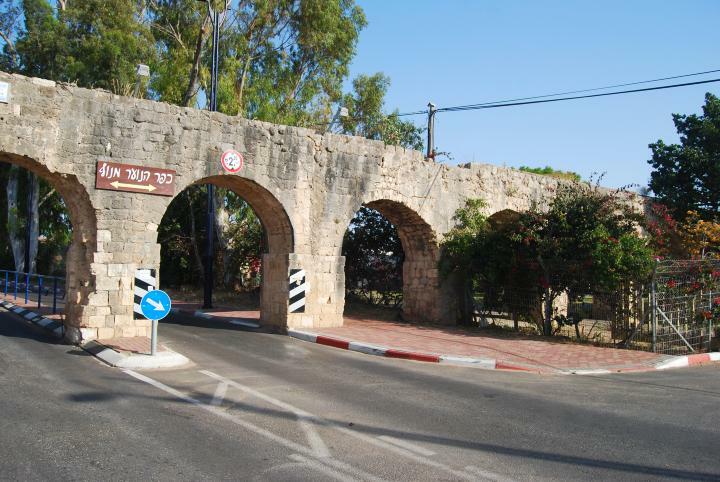 This photo shows the Ottoman aqueduct in Kibbutz Lochamei-Hagetaot, about 6KM from the end of the water line in Acre. The next photo shows the aqueduct at the same location, with a double level structure. 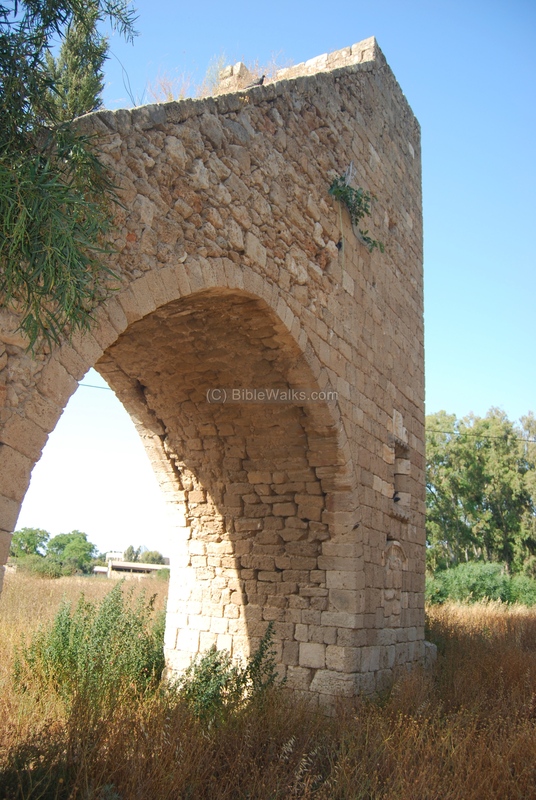 The bridge was constructed in order to pass the Nahal Yasaf creek. An aerial view of this section of the aqueduct is seen below. The aqueduct is seen here passing near the amphitheater of Kibbutz Lochamei-Hagetaot. 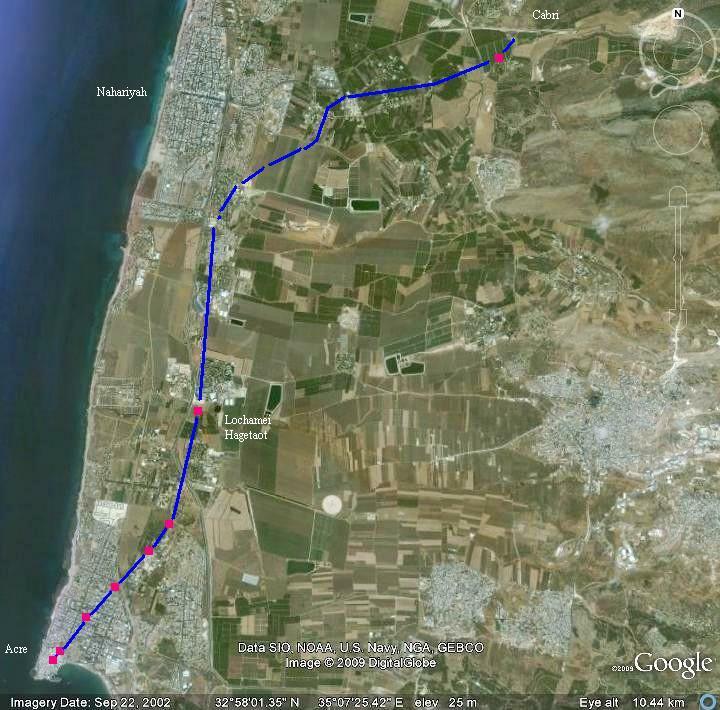 The road from Acre to Nahariyah is seen west (left) to the aqueduct. Thanks to Y. Mizrachi on this photo! The aqueduct continued south and reached the northern outskirts of Acre. 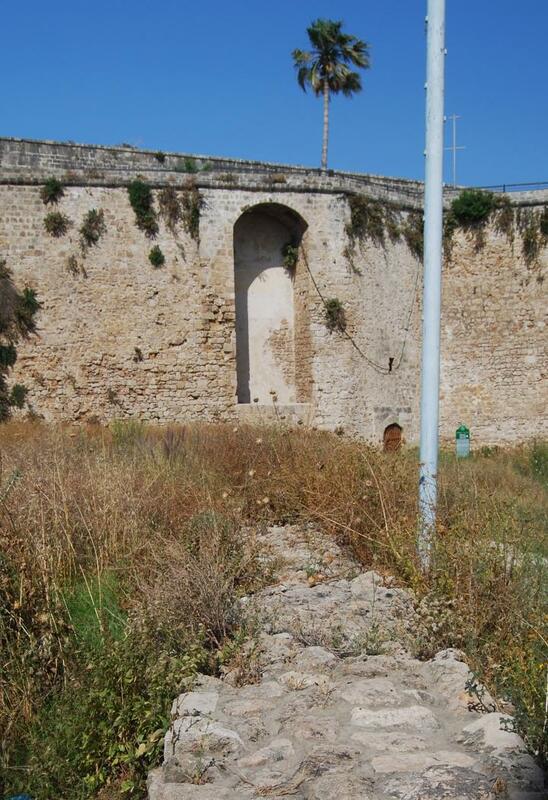 The photo below shows the last section, in the Manof youth village, where the public road passes under the arches. Inside the youth village is the first siphon tower, where the water slides down from the open canal into the ground pipes. This is the first siphon tower, which converted the open system to a covered pressure system. The photo below shows the slope where the water is pushed into pipes. The pressure of the sliding water pushed the water through the pipes and other towers towards the city. One of the modular stone units is seen below. The typical sizes were 60 x 35 x 35 cm. The "male" side is seen in the front, and this side fit into the "female" side of the next modular unit. Along the aqueduct it seems that all "males" were in the south orientation. This unit is a corner stone; it has a vertical hole on the top - a hole where the vertical pipe connected to the horizontal system. Inside the pipe you can notice the build up of a deposit of limestone stone as a result of many years of use. The pipes connected to the aqueduct through a pair of pipes which were constructed on a raised sandstone mound, and continued south to the next siphon tower. The pipes seen below are with the "female" side pointing to the north. This siphon tower is located 530M south of the first tower. 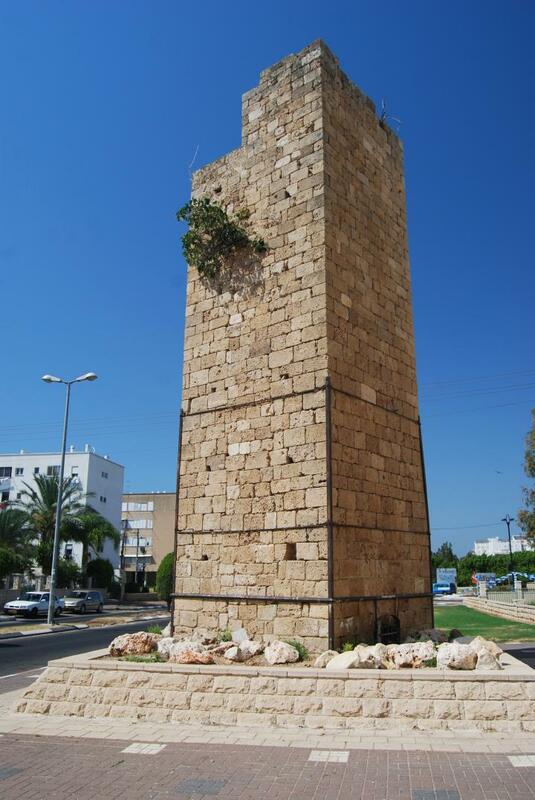 The tower served as a bridge over the Acre-Beirut road. The photo below shows the southern side of the tower. 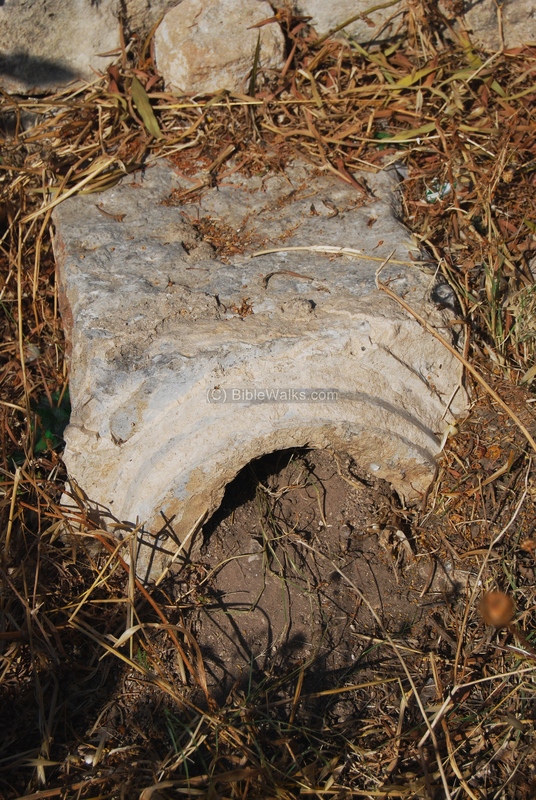 A stone plate was once embedded on the right side of the arch. A detail of the modular stone unit is seen below, on the side pointing towards the city on the south. This side is the "male" side. The photo below shows the siphon tower near the city's north junction, in the Wolfson neighborhood, 490M south of the previous tower. Inside the tower is a narrow cavity with stone notches, which enabled the maintenance crew to climb up the tower and clean it. A closer detail on the northern section of the pipe is seen below. This is the "female" side. The next tower is located on David Noi street, adjacent to the Religion council offices, and 560 M south of the previous tower. The cavity of the round vertical pipe is seen here on this western side of the tower. 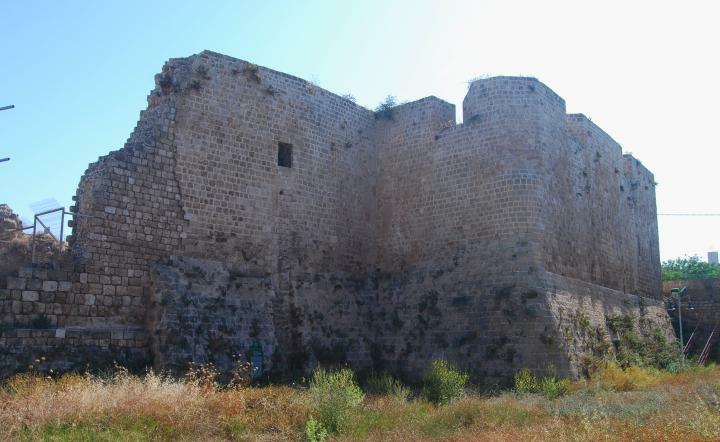 The next tower is located on the edge of the north moat, 480M south from the previous tower, and 100M east of the Weissman street entry to the old city. The pipe then goes down underground, and past the high walls. The photo below shows the other side of the walls - on a section of the northern inner moat. 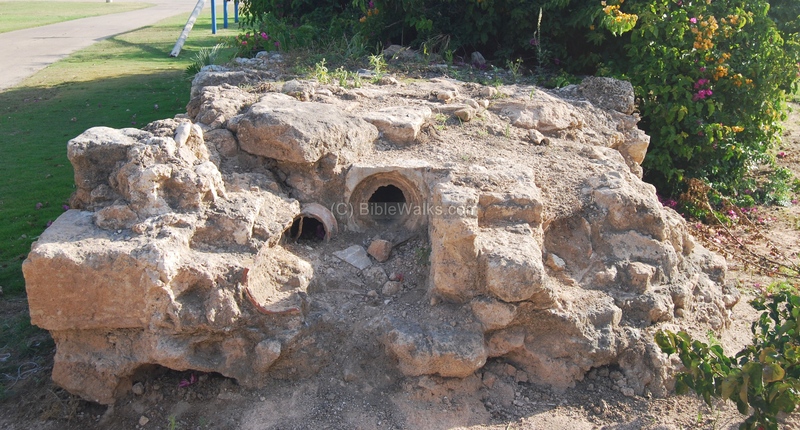 A sebil (water fountain) is seen embedded into the wall on the right side of the photo, which served as the source of drinking water for the soldiers who defended the city. 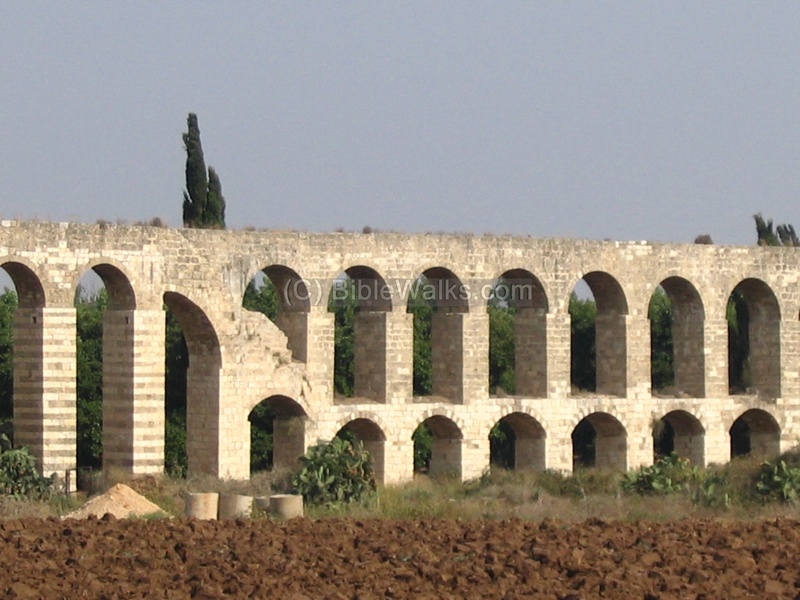 From the sebil, the aqueduct continued south via modular units covered by stone. The stone pipes enter the north tower, as seen in the photo below (viewed from the inner moat towards south-west). This entry can be seen in the center of the wall, under the window, with the pipe going up to the top of the tower. Behind the tower is the last siphon unit, and the city itself. The last siphon tower is embedded in the north tower. The waters slide down into the pipes, and are distributed to the city. 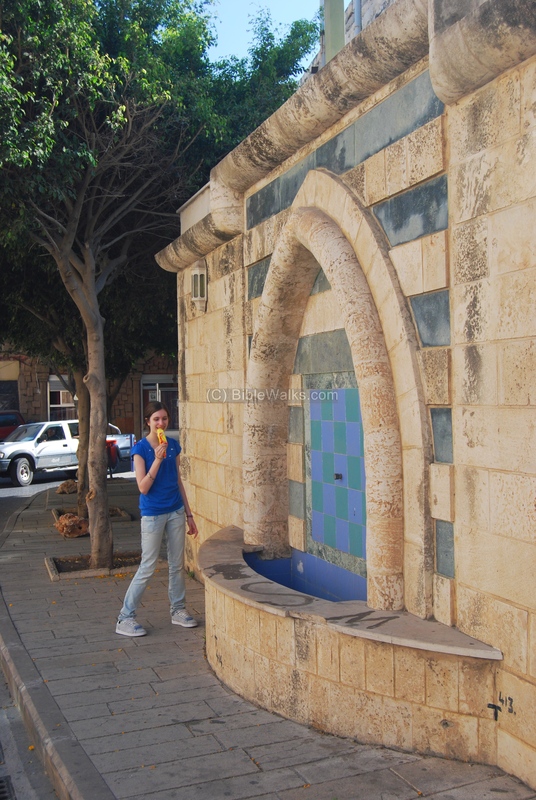 There were more than 30 sebils (water fountains) and many water cisterns in the city. A grand fountain is seen on the right side of the entrance to large El-Jazar Mosque in the center of the city. Another reconstructed sebil is located near the eastern gate.